Many people assume Financial Planning is about investing or picking certain financial products. Over 30-40 years most people accumulate lots of financial stuff and lots of financial relationships. They have stock brokers, bankers, accountants, insurance agents and current and past retirement plan representatives. These representatives can usually explain about their specific product allocations, risks and taxes. But because they usually cannot recommend if you have enough to retire at any date, relocate, buy a vacation home, RV, boat, motorbike, take long vacations, make gifts to the kids, move to a 55 or over retirement community and not worry about running out of money. Also, they usually cannot provide overall tax or estate planning strategies. 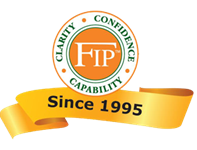 The Financial Independence INFO Meeting© is a short, complimentary informational (INFO) discussion of your goals and concerns and of the Financial Independence Planning (FIP) Process. Our Unique 8-Step Financial Independence Planning process can help you to coordinate and consolidate your financial stuff and your financial relationships. We help you understand Your Total Financial Picture with a Financial Roadmap Check-Up which summarizes your values, goals, all of your assets, investments, taxes and insurances, a customized Financial Independence Plan which analyzes all of your financial information and includes recommendations to make well-informed choices today and an experienced Financial Independence Planning team to monitor your progress and to make well thought out choices tomorrow. not subsidiaries of nor controlled by Voya Financial Advisors. 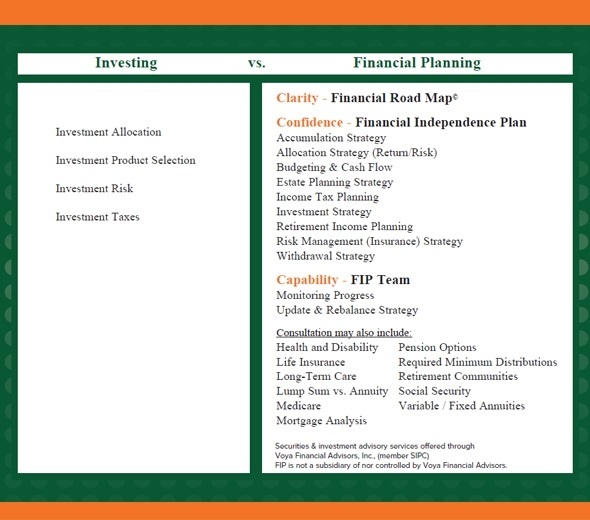 Determine if the Financial Independence Planning, LLC™ Process can benefit you.